Model 326 Series Pyrometer Kits provide a flexible and inexpensive method of accurately measuring temperatures from 0°F to 2300°F (0°C to 1260°C). The meter is a D'Arsonval type millivolt meter which has a scale to indicate temperature rather than voltage. 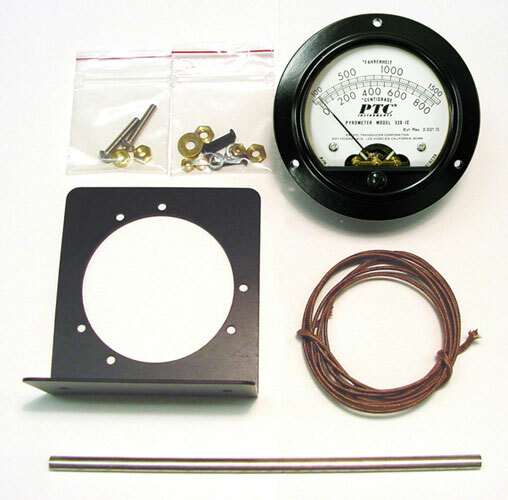 The pyrometer kits can be used in many diverse applications, including the temperature measurement of furnaces, kilns, and ovens; platens, rollers, and hot plates; dies, weld preheats, exhausts, motors, etc. The meter is flanged for easy mounting on a panel or dashboard. Six feet of thermocouple wire is provided in each kit. The wire is either Iron Constantan or Chromel Alumel, depending upon the temperature range. The wire is double glass insulated to withstand high temperatures. A stainless steel tube is provided to keep the glass insulation wear to a minimum in high temperature applications.